Well, the Wife's off to Austin, TX to help celebrate the passing of time and I've got a furlough. Do I go to the Barrel Aged Beerfest? Do I go to the Cross Races under the lights? No, I'm safely tucked away in The Hidden Fortress with a pantry full of tins and a fridge full of beer. Staying home, watching what the General Public views as B Movies, to bring you useless information on tins of sardines you probably can't or won't try to find. Normally I would be following a recipe when the Wife's gone, creating some fantastic tinned sardine entree, but tonight I'm going to clean some tins out of storage. 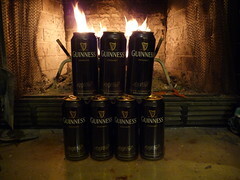 I have four of the six tins brought back from Dublin, Ireland by Mr. Jonnie Carpo and I'm going to pop em all. 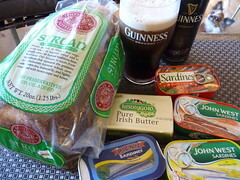 I picked up two four packs, a brick of Kerrygold Pure Irish, and a loaf of Straun Harvest Bread from Brother Juniper's bakery. Toast it up, add some greens and it's on. I was going to bake a loaf of Amazingly Easy Irish Soda Bread but I overcooked a TJ pizza I was going to have for lunch and decided I was glad I bought the Straun Micheil as a backup. I think there's some Jamie around here as well. Two tins are in sunflower oil, and two tins are in tomato sauce. I've not enjoyed a tomato sauce tin yet and I'm thinking side by side will be interesting. Let's start at the top. The Yellow edged tin at 10:30. John West (JW) is a fish tinning company popular in Ireland and the UK. 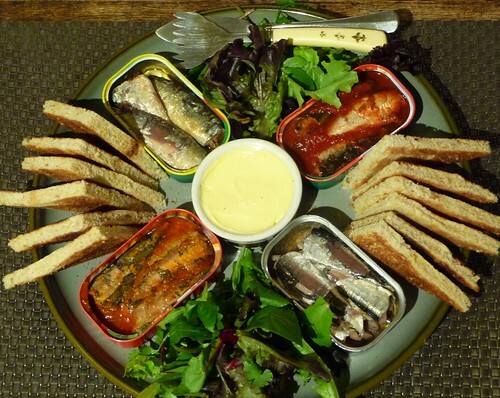 Sardines, Tuna, Salmon, Mackerel, and Anchovies. 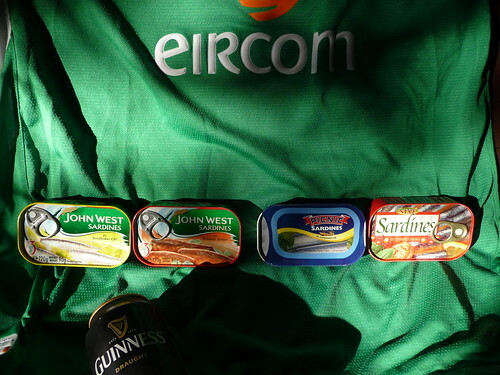 The Sardines are tinned for JW (Liverpool, England) in Portugal. Hilarious or Interesting, I'm not sure, but they are revolutionizing the tinned fish market with such products as No Drain Tuna AND Sardine Tempters, which I think are sardines in a more traditional tuna tin style layout. This style of packaging is bound to appeal to tuna people and will make it obvious to use these tins just as you would in any tinned tuna recipe. Like an Onion and Tomato Sardine with Cucumber Sandwich. This is how I see or imagine the CRSC is packaged. I still haven't ordered a tin, mainly due to the pantry overflowing. Sorry. On to the tin. JW In sunflower oil. Three big fish, bone in, skin on. A light schmeer of butter on a toast point, a pinch of greens and a chunk or two of love. 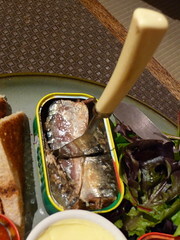 The sardine fork cuts the big fish right into bitesize. Clean, Killer, Nice to Have the Skin and Bones. Next, the John West in tomato sauce. Red edged tin at 1:30. After that last JW tin I'm not afraid. Going to stick with the light schmeer of sweet butter. Wish I had some bacon. Again, three big fish, skin and bones. It's a tasty sauce, bit o herbs, no butter needed, put it right on the toast point. I'm enjoying this, but let's cross the platter to the Nixe, at 7:30, before rating this. Nixe, while being purchased in Dublin, are a brand for a discount chain known as Lidl. Expiration date: 31.12.2009. Reaching maturity, the label is in four languages, and I can't decipher where these where tinned. Again. Three big fish, skin and bones. These fish are a bit soft. Not exciting but not bad. The JW has a tastier sauce, prettier fish, and seem proper. These are Peruvian "Pacific Sardines" (Engravlis Ringens) in a package that screams of pallets and pallets of tins bought by grocery wholesaler Beck, Smith and Associates and shipped over, and then shrink wrapped accordingly. Seven medium fish, meh at best. Skin on, no bones. I'm done with that tin and going back to finish off the others. Two Tins for the Picnic. 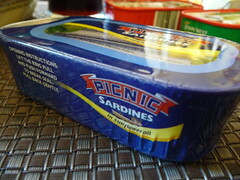 Well, I've cleaned out the pantry of more Smuggled Tins, and, I've developed a taste for sardines in tomato sauce. I have a few more Unobtainiums, France and Italy, but I also have some Scandinavians and Japanese sourced locally, and a very scary tin I got at a Murder Mart in Unincorporated Hayward. What the hell are you eating? Didja go out to that weird store and see what tins they have?